Until now, the articles in this series have dealt primarily with the thermodynamic principles and basis for materials processing as applies to heat treating steel and aluminum. In this article we will delve into the practical application of age hardening, a phase transition in materials science formally referred to as precipitation hardening. The technique of age hardening evolved from the original observations of the German metallurgist Alfred Wilm in the early 1900s. Wilm conducted a series of experiments in search of an aluminum alloy that could be hardened by quenching from an elevated temperature in the manner of steel. In one particular aluminum alloy which contained 4% Cu, 0.5% Mg and a small amount of Mn, he accidentally discovered that the hardness of the quenched alloy increased over time at room temperature. In 1906 he patented this “age hardening” alloy, which was later marketed as Duralumin. However, Wilm did not understand the fundamental reasons for the age hardening mechanism. In 1919 P.D. Merica, R.G. Waltenberg and H. Scott clearly demonstrated the decreasing solid solubility of copper in aluminum with decreasing temperature in their seminal paper “Heat Treatment of Duralumin.” They proposed that age hardening arises due to this effect, where at high temperature the alloy will exist as a homogenous solid solution. If after such a “solution heat treatment” the alloy is rapidly cooled to room temperature by quenching in water or some other liquid, the formation of the hard intermediate θ phase (CuAl2) is suppressed and an unstable supersaturated solid solution results. They hypothesized that hardening resulted from precipitation of the second phase when the quenched alloy is “aged” for sufficient time and the precipitates were in the form of a fine “submicroscopic dispersion.” They also found that the increase of material hardness could be accelerated at temperatures above room temperature, but below the solution treatment temperature. 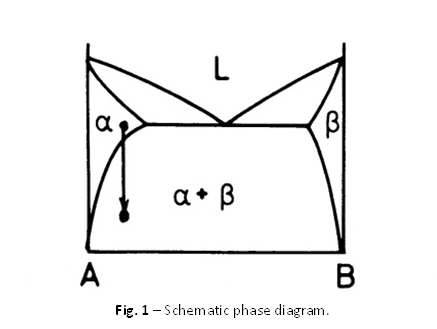 Merica and his colleagues suggested that examination of relevant phase diagrams, where a high temperature solid solution transforms into a lower temperature two phase region with a minority phase embedded in a matrix of the original phase (see Fig. 1), would reveal likely candidates. This idea proved to be astonishingly successful for the development of new age hardening alloys. By 1932 Paul Merica and his colleagues identified fourteen base metal alloys that hardened by precipitation in a total of more than a hundred different alloy combinations, with mechanical properties that were dependent on the intermediate age hardening temperature and the length of time the material was held at temperature. The structural changes taking place during the early stages of ageing were beyond the resolution of the optical microscope, so little progress was made in understanding the processes and how the precipitates resulted in hardening of these materials. 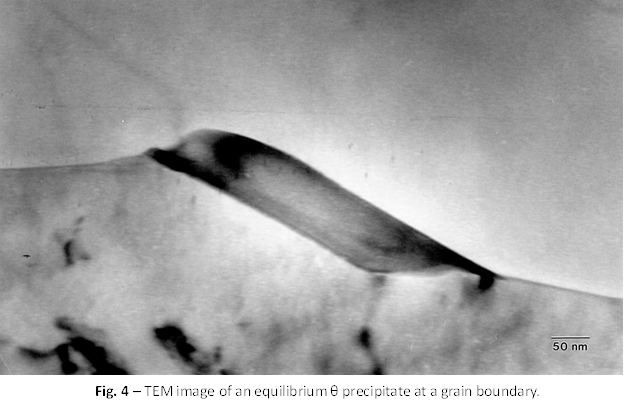 In the late 1930s A. Guinier and G.D. Preston independently employed sophisticated X-ray diffraction techniques that helped unravel the precipitation process. 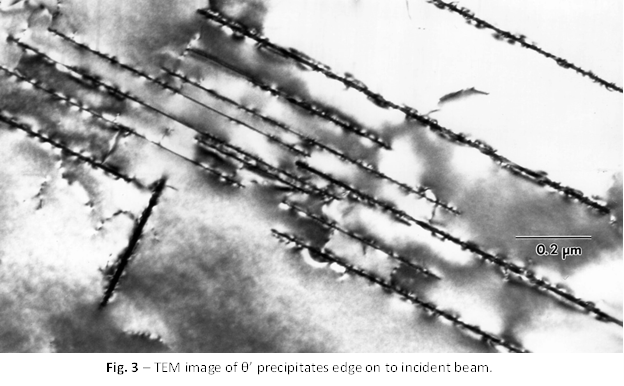 But it was not until the application of the transmission electron microscope (TEM) in the 1950s that direct evidence of the changes occurring during aging and the effect of precipitates on plastic deformation of these materials came to light. It is now appreciated that small precipitates serve to block the motion of dislocations moving through the crystal structure of the material, thereby increasing material strength and hardness. The size and shape of the precipitate particles, whether they are hard or soft and the nature of the interface between the precipitates and the matrix they reside in have significant influence on the ultimate properties of the aged alloy. The aluminum alloys whose principal alloying element is copper (ASTM 2000 series) are the oldest and most widely used of the aluminum systems. In fact, the term aluminum alloy, when not further qualified, originally referred to Al-Cu alloys with or without small amounts of other alloying elements. As such, the Al-4%Cu system is an excellent vehicle for illustrating the age hardening mechanism. In 1938 Andre Guinier and George Preston discovered the presence of small copper rich zones in aged Al-4%Cu from streaks in X-ray Laue diffraction patterns, while studying the processes leading to the precipitation of the thermodynamically stable CuAl2 θ precipitate. The discovery of these “GP” zones led to the unraveling of the precipitation process exemplified by this binary alloy system. The Al-4%Cu alloy represents a classic example of age hardening, where small precipitates that form during heat treatment serve as effective blocks to dislocation movement. It can be seen from the phase diagram for the Al-Cu system (Fig. 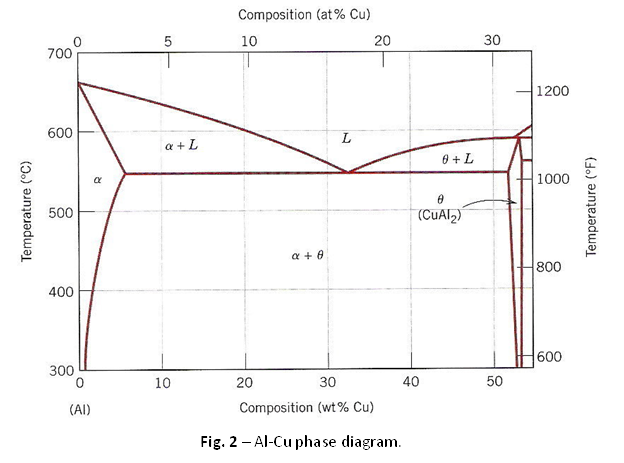 2) that if an alloy of Al – 4wt% Cu is heated above about 540° C, all of the copper will be in solid solution as a stable FCC α phase. By rapidly quenching the specimen in water there is no time for any phase transformations to occur so that essentially, the solid solution is retained at room temperature. However, the solid solution is now supersaturated with copper and there is a driving force for precipitation of the equilibrium θ phase. If the alloy is subsequently aged at a temperature between ambient and 180° C (the GP zone solvus), the first precipitate to nucleate is not θ but coherent Cu-rich GP zones. This may sound like a contradiction, considering that the thermodynamic driving force for the precipitation of GP zones is less than that for the equilibrium θ phase shown in the phase diagram. The contradiction is resolved by the fact that the relative activation energy barrier for nucleation of GP zones is much smaller than that for the θ precipitate. Since GP zones are fully coherent with the matrix, they have a low interfacial energy whereas the θ phase has a complex body centered tetragonal crystal structure which can only form with high-energy incoherent faces. The GP zones minimize their strain energy by forming as discs perpendicular to the elastically soft <100> directions in the FCC matrix. where the various alphas in the reaction represent the composition of the matrix in equilibrium with the corresponding precipitate phase. By now, the theory of precipitation hardening is well established and is manifested in a host of base alloy systems including Al-Cu, Al-Zn, Mg-Al, Cu-Be, Ni-Cr, Cu-Sn, Ti-Cu and a number of other ternary and quaternary titanium alloys. Over time the base systems have been enhanced by the addition of additional minor alloying elements to optimize the desired material properties. And we don’t want to overlook the ferrous based systems such as maraging steels and a number of stainless steels. One of my favorites is PH 17-4, a martensitic stainless which derives its moniker from the addition of 17% Cr and about 4% Ni (with a number of other minor alloying elements). This stainless grade is prized for its outstanding combination of high strength, hardness, toughness, weldability and corrosion resistance. The reason I like it is because it is commonly used to fabricate golf club irons that hit the ball farther than forged steel irons. Although we have discussed aging in terms of hardness, there are other mechanical properties that can be influenced and optimized by the precipitation process. Depending on the application of interest, one can affect tensile/yield strength, toughness, ductility, creep and even the spring constant of the material. Aging can improve machinability, enhance wear resistance and improve high temperature corrosion resistance. Solution Treatment – the alloy is heated above the solvus temperature and held there until a homogeneous solid solution is produced. Quenching – the alloy is rapidly cooled, usually by quenching in a liquid, which forms a metastable solid solution. Aging – the alloy is heated to an intermediate temperature below the solvus to produce an array of finely dispersed precipitates which serve as pinning sites for dislocation motion that in turn strengthens and hardens the material. The precipitation hardening or age hardening process provides one of the most widely used mechanisms for the controlled optimization of metal alloy properties. The evolution of the age hardening hypothesis is now credited with insights into other important material phenomena including slip motions in crystals and modern dislocation theory.